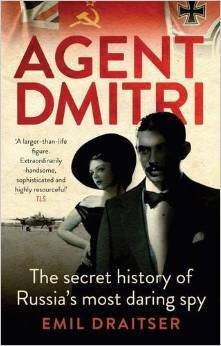 When I saw the tagline “The Secret History of Russia’s Most Daring Spy” I mentally checked it under exaggeration for the sake of publicity. After all, every good book needs a tagline to draw in the reluctant reader; something to get the bookshop browser to pick up the book and pay the man, and something to make the internet browser stop long enough to gain interest. But as I read through the book I realised that this tagline might also be a true statement. Dmitri Bystrolyotov was born in 1901 in the Crimea, brought up with an aristocratic foster family and was a young man during the 1917 Revolution. If fate had dealt him a different hand he may have lived out his life in privilege and splendour, as it happened, he entered a world of espionage and intrigue, spurred on by the love of his beloved Homeland. It was a love he never lost, but one that would cost him. Emil Draitser writes with both compassion and detachment. He obviously feels passionately that Dmitri’s story should be told, but he also holds a writer’s cynicism…he questions motives, looks to see where exaggeration may have sneaked in and searches for the truth in what he was told and what he has found through his own research. And that is one area where Draitser has excelled. Throughout the book he refers to his sources in a way that does not affect the narrative, and the copious notes and bibliography allow the reader to look further into the facts of the story. Facts that could have jumped from the pages of a Fleming novel. As a biography this book reads like a spy novel, because that is what it more or less is…only it isn’t fiction. And believe me there are times in this book that will make you question the truth…like the time when a bunch of spies make their way through country borders disguised in a manner that is straight from the Hitchcock film “The Lady Vanishes”, and a near fatal meeting high in the Swiss Alps. Reading Dmitri’s story you swing between admiration for the man who stood by his belief in his country, even when it caused him to be viciously beaten during interrogation, to disgust that he could treat people in such a callous and quite frankly evil manner (even those closest to him) and to horror at the treatment of political prisoners who ended up in the Gulag of Siberia. It’s a story of two halves, the Spy Dmitri…full of self-confidence, a womaniser, living the high life while spying for his country, and the Prisoner Dmitri…beaten, broken, but with the will to live despite the overwhelming odds. What comes through the pages is that with such intelligence, and being highly skilled at languages and an accomplished artist, Dmitri was broken by a regime that could have nurtured him. When I first started to read this book I wasn’t totally sure what I would think of it. There are so many dry biographies out there, ones that give you the facts without an inkling of story-telling. However, this book had me gripped from start to finish, and with quite a few instances of disbelief, just enough to make me question reality. Draitser has woven the story of a man whom he met shortly before his death, with style and dignity. As any historian will tell you, the people that you research can get under your skin…and here, Dmitri deliberately sought out Draitser in order to tell his story but never followed up when the latter moved away from Russia. This book is the culmination of memories, painstaking research and family archives. As a biography this is an intriguing, informative and an easy read. There is a well crafted index, an informative notes section, a good select bibliography and a few pictures and diagrams. I would have liked more pictures to illustrate his story, but the ones that appear do show you how one man can have disguised himself so well and taken on the numerous personas needed for his intelligence work. As a story, it rivals any spy novel out there. Dmitri’s career was an impressive one, fuelled by a need to survive, love for his country and misguided loyalty to a regime that would chew him up and spit him out. Why not visit Duckworth Publishers to find out more about this book? I’m not a big fan of spy novels, but I AM getting into biographies – especially biographies that read almost like novels, they are so interesting 🙂 This sounds like a good one! It really is good, and from a small independent publisher I am really impressed. Plus, there’s a hell of a lot of references, so when something reads more like a spy novel you can check out where the information came from.